Wow! I’ve never heard you ask for advice so urgently. I hope this reaches you in time to be helpful. As I understand it, you’ve been asked to preach a “children’s sermon” and you are totally freaked out. Don’t panic. Help is on the way. I’ll confess: the idea of the children’s sermon used to baffle me too. In fact, before I became a pastor I told myself that if a church wanted a children’s sermon every week (or ever) I wouldn’t take the call. When I did take a church they did want a children’s sermon. They only told me after I took the job. It turns out there were several reasons behind my uppity attitude. First, I didn’t have any kids yet, and I had no clue about how to relate to them. Second, the great majority of children’s sermons I’d heard had been frankly awful. Third, I really hadn’t given much thought to the incredible privilege it is to share the faith with kids. Jesus did make a point of saying that he really, really wanted the children to come and be near him — and that the grown-up disciples were wrong to look down their noses as if kids weren’t important enough. These days when I get to be a guest preacher I always ask if I can do the children’s sermon too! I could actually go on about children’s sermons for a very long while, but I don’t want to overwhelm you. Since you need to be ready to roll in less than a week, and since it sounds like your blood pressure is in running dangerously high, let me start you off with one, simple, central suggestion. It really is simple. It is at the heart of the gospel. And you would not believe how few pastors try it. 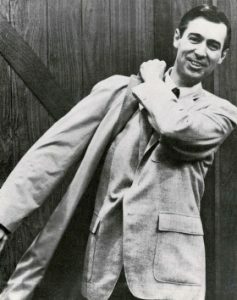 Make Mr. Rogers your role model. You remember when you were about four to seven years old — about the age of the kids who come up for the children’s sermon. He came home, and put on a comfy sweater. He looked out at you through the camera with a gentle smile. Then he said he was glad you were his neighbor. Remember how that made you feel? When you are a kid it is just wonderful to have a grown up friend. Having someone who really sees you, who actually likes you, who says you are special — and means it — makes life good. He was a Presbyterian minister, by the way. He acted like that because it was his ministry. Notice also what Mr. Rogers didn’t do. He didn’t look down at you — either physically or in his attitude. He didn’t put you on the spot with complicated questions. He didn’t talk on and on in ways you couldn’t understand. And he never, never laughed at you. I don’t know if you’ve noticed but a whole lot of pastors, give children’s sermons that condescend, quiz, baffle, and make jokes about little kids. Do you wonder why they drift away from church a couple years later? So what are you going to do with the kids in worship? Whatever else you do, make it a Mr. Rogers Moment. Sit down with the kids. Look at them with a friendly smile. Tell them you are glad they are there. Tell them they are special. The children’s sermon, no matter what words you use, needs to embody the gospel. Jesus himself embodied the gospel (obviously) and when it came to time with kids, he invited them to come close and he sought to be a blessing. Focus on those kids. Tell them they are special — because they are. Every one of them is created in the image of God. Try very hard not to be funny. If the grown-ups laugh during your children’s sermon, you have very probably failed. Enjoy! I’ll be praying for you. This post is part of an ongoing series on children’s sermons. To read the next installment click here. Thanks for stopping by! I’d love to send this and all my new posts straight to you via email. Sign up for my weekly(ish) newsletter using the button below the post. Gary, great advice. Before I became a pastor I often thought my pastor’s children sermons were often better than his regular sermon because he followed the acronym KISS. My scary moment was one sunday I was the guest preacher for that church on a fourth Sunday of the month. That Sunday was the “Stump the Pastor” Sunday. During the hour before the service the children would chose a prop and the teacher would hide that prop in a paper bag. At start of the “Children’s Sermon” the Sunday School teacher would give the pastor the prop and the pastor would have to do a children’s message on that prop. That would be a scary moment indeed. Argh! Having to make up something useful to a child’s faith development from a random object… I’d far prefer making use of the excellent biblical texts chosen for the service. Wonderful post, Gary. I especially like your use of Mr. Rogers. We recently introduced him to our three kids (not sure why it took so long! ), and we’ve been amazed how much they enjoy his show. (I’ve been equally surprised how much I enjoy the show — I think we adults need to hear “you are special” as much as our kids.) Anyway, I was curious, could you expand on your statement: “Try very hard not to be funny. If the grown-ups laugh during your children’s sermon, you have very probably failed”? I have no pushback on it, but simply found it intriguing and would love to hear more. Blessings to you and your family! We introduced our kids to Mr. Rogers (also a bit late) when we moved to Pittsburgh. Turns out we were actually moving into his old neighborhood. It eased the hard transition a bit. And they lapped it up. Thanks so much for asking about the humor comment. I’ll write on that in a future post. I’m trying hard to get back to posting this series on Thursdays, so stay tuned. Blessings to you and yours as well. I miss you! P.S. : You really are special. I received this advice about children’s sermons ” Children are often made the object of a lesson that is really geared to the adults. Don’t do that.” I work hard at remembering that. My question is, how do I present a children’s message to the wide age range of kids that come forward, roughly age 3 to 12? And I never know if I’m going to have the full range, or just the littler ones, or just the bigger ones. Thanks for sharing this, Roxie. I think that you are right on the money. This is one of the crucial problems common to children’s sermons. I’ll expand on this (as well as finding ways to speak to the whole target mini-congregation) in future posts in the series.